IN December last year, I wrote an article about the mysteries and uncertainties of what is known as the Dark Net or Deep Web. I have since taken a dive into the murky online waters and have been astounded to discover how easy it is to become a web-pirate. It was like jumping into a dark lake fully expecting to sink deep, only to discover that the water barely reached my ankles. 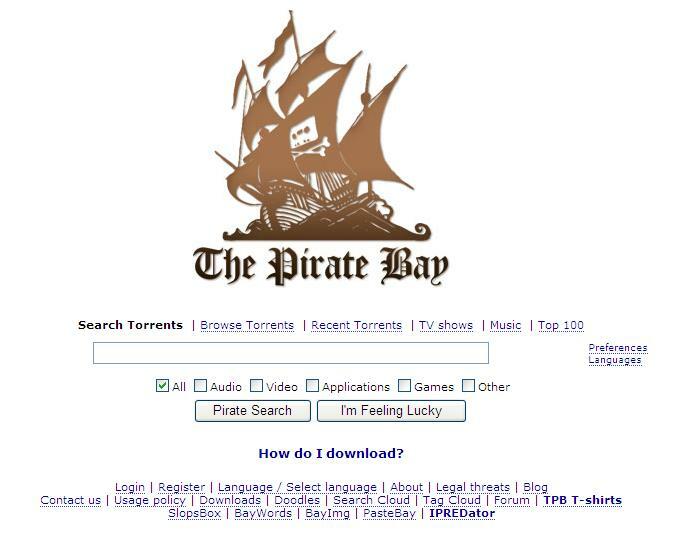 Over the holidays, I heard of a Swedish-run website called The Pirate­ Bay (www.thepiratebay.org). The popular site has mimicked Google by offering an easy-to-use search bar on its home page. In place of the comforting Google logo is a pirate ship and just below the search bar is a link to a step-by-step guide on how to download movies­, music, games, TV series, applications and more. Websites such as The Pirate Bay are known as BitTorrent trackers. BitTorrent is a file-sharing protocol whereby computer users are able to upload and download (‘share’) computer software with one another over a network. Each individual is allowed complete anonymity and does not need to register to participate. However, there is a shared understanding among Pirate Bay users — a sort of pirating etiquette — that an individual should make a certain amount of their own content available for others to download if they wish to download software themselves. But this is not an enforced requirement. There is no cost involved for those wishing to download content and the website earns its revenue by displaying certain adverts alongside torrent listings. In an investigation in 2006, Swedish police concluded that The Pirate Bay was generating roughly $150 000 per year from advertisements. This figure is likely to have tripled since then. The Pirate Bay is still primarily funded by advertisements but supporters or users also have the option of donating money towards the pirate cause. There are also Pirate Bay T-shirts available for purchase off the website — which, in effect, spreads pirating awareness. I’m confident that anyone who might consider themselves as technologically incompetent would be able to engage in such activity. You only need to be able to read, write (search) and click a mouse. Initially established in November 2003 by Swedish anti-copyright organisation Piratbyrån (The Piracy Bureau) The Pirate Bay has operated as a separate organisation since October 2004. The website is run by Gottfrid Svartholm (aka anakata) and Fredrik Neij (aka TiAMO), who have both been charged with assisting in making copyrighted content available due to their involvement in The Pirate Bay. The members of The Pirate Bay represent a broad, global spectrum of file sharers and there are currently more than four million registered users. However, because registering is optional and not necessary to download content, the total number of users is likely to be far higher than this figure. The site gets huge influxes of frequent traffic, so much so that the service is often unavailable at certain times. However, the site claims this never lasts for more than a few seconds. The thing that I find the most astounding about The Pirate Bay is its completely fearless attitude. The creators have faced several lawsuits and have been to court on more than one occasion. Their argument is that no illegal material is stored on The Pirate Bay server. Rather it operates as a tracker — providing users with the correct paths to find content on other users’ PCs and download directly from them. According to their disclaimer (if one can call it that) “only torrent files are saved at the server. That means no copyrighted and/or illegal material is stored by us. It is therefore not possible to hold the people behind The Pirate Bay responsible for the material that is being spread using the tracker. Any complaints from copyright or lobby organisations will be ridiculed and published on the site”. This last line illustrates my point about the fearless attitude. They have received several legal threats via e-mail from companies such as Microsoft and DreamWorks, which have been published on the website along with their cheeky responses for all Pirate Bay users to see. It appears that their trump card is claiming that U.S. infringement laws to not apply in Sweden and they seem to have Swedish lawers on their side. b) a formal complaint lodged with the bar of your legal counsel, for sending frivolous legal threats. The Pirate Bay shows no signs of slowing down and remains the world’s largest file sharing server to date. I leave you with a snippet from The Pirate Bay’s 2009 Christmas letter to its users. The downloading and distributing of copywrited software IS illegal, despite what websites such as The Pirate Bay might say. The use of such websites is done at your own risk and can lead to a criminal record. Ye have been warned.